Monoammonium phosphate also called Mono ammonium phosphate or Ammonium dihydrogen phosphate, NH4•H2PO4, is formed when a solution of phosphoric acid is added to ammonia until the solution is distinctly acid. It crystallizes in quadratic prisms. 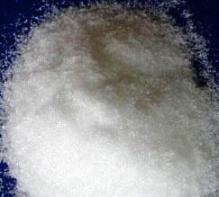 Monoammonium phosphate is often used in the blending of dry agricultural fertilizers. It supplies soil with the elements nitrogen and phosphorus in a form which is usable by plants. The compound is also a component of the ABC powder in some dry chemical fire extinguishers. This substance is also supplied in a jade green or aquamarine crystal growing box kit for kids. Diammonium hydrogen phosphate also called Di ammonium phosphate or di ammonium phosphate, (NH4)2HPO4, is formed by evaporating a solution of phosphoric acid with excess of ammonia. It crystallizes in large transparent prisms, which melt on heating and decompose, leaving a residue of metaphosphoric acid, (HPO3).